Next post: What is Illicit Happiness? Businessmen and women friends. Go to Chile. Now. You could be a student or native entrepreneur. Go. South with your partners. Silicon Valley dreams are giving way to the lure of Chilecon Valley, declared the Economist last year. According to an article, despite several other nations’ attempts to replicate a Silicon Valley and failing, Chile’s has been an incredible attempt to capitalise on the weak spot of the Silicon Valley dream — the murky waters of US immigration policy. In what has fast gained currency as the most disruptive initiative in public policy in recent years, Chile has opened its doors to the world, setting out to achieve a realistic goal of becoming the innovation and entrepreneurial hub of Latin America. I found out about StartUp Chile while surveying story possibilities for a fabulous international education e-zine about the rise of foreign student entrepreneur migrants, a demographic that I felt existed even if it was not often written about or analysed outside of say, the Silicon Valley context. Set up in 2010, Start Up Chile has now inducted over seven generations of foreign born entrepreneurs (not just students, even if the age of the typical SUPChile entrepreneur falls between 18-40) . The program is open to all/foreign entrepreneurs of any age, offering incentives to applicant winners of 40000$ equity free capital, office space and an initial year long visa in Chile (that is extendable, depending on how well you have capitalised your opportunities) and serves as an equal inspiration to locals too, who get tremendous exposure to some of the world’s most dynamic entrepreneurs and work ethos. In my initial round, the Chilean government spent $ 920,000 on entrepreneurs, plus likely another $ 300k on offices, salaries, promoting the program and travel. So for $ 1.25m, Chile got three big things. First, it’s the best PR campaign in history … Chile appeared in The Economist, Wall Street Journal, Forbes, NY Times, BBC, Financial Times and every influential tech blog in the world as an innovative, safe, forward thinking, entrepreneurial country. A half page ad in the Wall Street Journal costs $ 250,000 for one day and that’s an ad! Chile got its money’s worth just from the good press alone. [Lustig, Nathan (2012-12-17). 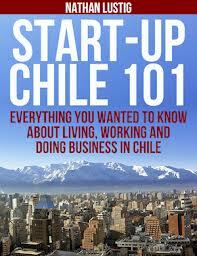 Start-Up Chile 101: Everything You Wanted to Know About Living, Working and Doing Business in Chile (p. 134). Nathan Lustig. Kindle Edition]. When I asked Nathan why he chose to self-publish this eminently readable book, he said, it was the easiest most straightforward way out, as he expectedly reaped the good royalties Amazon offered on a book that was best discoverable online through algorithms. In fact, Nate intends to do another version of this book that talks about tourism and culture, rather than be specifically aimed at Chilean entrepreneurs. A lot of my MBA friends are wondering what to do as their next big step. I am pointing them to Chile. And with some proud help from local and alumni partners, my friends may just find big success if not small relief. I’ve even tried talking my employers into setting up some operations in Chile and have me man it there. Although, for now, it would be a big thing if I even get to exhibit at the Frankfurt Book Fair. Such. is. Life.